Native to Africa, America and Asia. 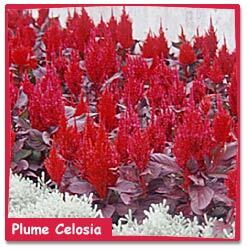 Celosia means "hot" in Greek. Plant after all danger of frost. 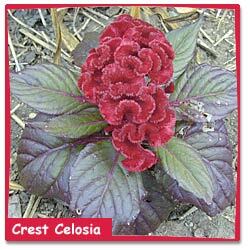 Planting celosia too early will cause the plants to stop growing. Celosia need full sun. They like the heat. Set the smaller varieties one foot apart and the taller ones two feet apart. Celosia have very bright colors. They have three different kinds of blooms; candle, crested and plume. Crested looks like a roosters comb. Celosia are good in dried arrangements.